I've seen the galleys - Flat was our landlord for 2 years ;) - and can't wait to see the book. It's gonna be great. Congrats Tsia & co.! that light fixture is amazing. i can only imagine how incredible that would look duplicated six times and hanging from your tin ceiling. beautiful! 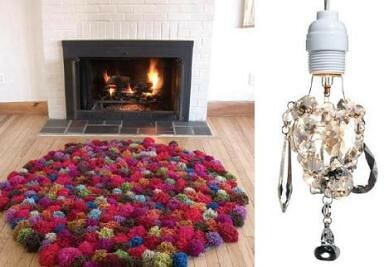 A pom pom rug. Whoda thunk? I used to make those to put on my ice skates. Great write-up on Craftivity. Tsia and all of the talented contributors really did an amazing job. It's a wonderful, inspiring book.